So it wasn't what I wanted to happen. The plan was to get 1st and have Eden fall somewhere below 9th so I could win the BARR (State Title). Well, that was a HUGE long shot, because Eden was riding really strong the last few races AND it wasn't likely that even 7 WSBA licenced racers would show. Sure enough, it was game over before the race started. I vowed to at least take the TT. Having been sick for 4 solid days since the TTT and feeling better Friday afternoon, I arrived bright and early this morning at the Base of Crystal Mountain turn off and highway 410 for the annual 6 mile climb up to Crystal Mountain Ski Area (oh yeah baby). I did a practice run and it was no Mount Lemmon (as that Arizona mountain is tougher, steeper, longer, higher). IF I could just keep a HARD pace to mile 3 and could spin a strong gear to the finish, I'd do well. Good intentions...but I saw Eden (who was racing just ahead of me) start 30 second before me gradually slip away. Argh........I dug deeper. Glancing up after that 30 second HARD effort....she was even further away. My chest heavy, my breath labored....my legs??? Heck, they felt good. Passing one woman, then another....it wasn't enough as my lungs didn't have enough for the day. I was 4th with a pretty weak time of 34 minutes. Next Year!!!! Okay, found this shot on Amara's website and I had to purchase it. My friend Kris and I did all the work on this Carnation Road Race and this image at the sprint finish says it all...yup, that is Kris and me looking at each other saying...wow, that was a fun race, how come we didn't catch that train to the finish. Beth says I should use it to post in front of my trainer for next year. Hilarious (be sure to click on the image and get the full detail). 6 minutes off of last year's time. 4.5 minutes to our nearest category competitor AND 3 minutes off from the TOP women's team. Yes, we rocked; yes we didn't leave ANYTHING on the course; yes, we brought home the GOLD in this year's State Championship TTT. YES!!!! 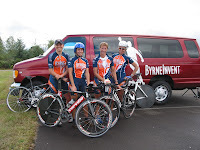 Cindi, Suzie, Kris and I all road together like we trained all season. It was a great ride....that will carry us into the next season. Thank you Team Starbucks for the ice down on Saturday; it saved my legs. I rode this race for two reasons; to try and secure my upgrade points (unsuccessful) and secondly to get a win for a fellow bike mate against the evil villain (successful). This was a flat, flat, flat course...and I hate those! I like to get those hills so the less than fit (and carrying a little extra weight) gals can't stay with you. I tried to get away twice and no dice. Today I race the TTT for the GOLD baby. We are winning it as we have trained in sloppy wet conditions and it looks like we might just have a wet one today. Its ours! Every year for the past 7 years (except 1) I've gone to cycle Europe. First it was Sicily and Almafi Coast, then Tuscany and the Lakes Region, Then the Alps, Burgundy and the Beaujolais and last year was the Pyrenees with a little Provence. This year? We conquer the Dolomites and the hills around Verona. Ah yes....back to Italy. We will be riding amid the grapes of the Prosecco wine region and Amarone. I will be providing daily blog entries on my sister site located here. The trip is from September 13 through October 1st. Stay tuned. Bellingham is a great town; they do however, have a hard time getting organized to do a race. I arrived EARLY saturday morning to do the State Omnium hosted by the little village of Fairhaven just south of Bellingham. I didn't do my homework to know the TT course...so I headed out, thinking wow, I'm usually hitting 20-25 of the flats and my speed is declining. Didn't I warm up? Is there a headwind? Wait, this is a deceptive hill. Crap! As I was 3/4 of the way up this hill, I remembered the profile and I should have spent my wad as the remaining 4 miles of the race was ALL downhill, fast and nearly out of gear. I left too much on the table...got 8th! Crap, I should have been top 3. Disappointed in myself I was about to call it a race (even after paying $60 bucks)...but a team mate called me and encouraged me to race the crit. I did. Boy did I! Without team mates I wanted to command the race. I worked hard, not smart. I lead the laps for 60% of the race as the climbs were too slow the the descents on this technical 0.7 mile course were too sweet to brake and the gals in front tapped the rubber too much for my liking. So I led. With two laps to go....the official yelled "Preem" and I thought...heck, I'm not going to win the race, I'll win a Preem. Blowing my wad, I lost the Preem by a half a wheel and could barely hang on for the last two laps. Finishing 5th or so...Sile yelled at me after the race in her Irish accent...."do you really need $10 on that Preem? I'll give ya $10 dollars!" I was happy to have finished in the elite group of racers upright on my bike. yes! Day two, stage 3. A twenty five mile road race in Nooksack with two walls in the middle of it. Yes, the first lap with a double Madrona Hill and the second (larger) lap with a Holmes Point or double Simons road (8%) for over a mile. Ouch. It scared many. It scared me. When we hit the first hill, I found that the gals in front of me had a pace that was too slow and uncomfortable so I weaved my way between them...started dancing on the pedals and found that I was a bike length a head. Could I keep it up? Yeah...but it started to hurt...but it also felt good, because I was ahead. Then I realized just 6 miles into the race...I needed someone with me....so at the top I paused for a select group of 8 that would narrow to 6 (from 20 racers) that would drive to the finish. I was going to lead out Sara, who was higher in the GC...but the finish was confusing and I missed that is was a drop in finish from 200 meters - 4th place. So....I got on the road happy. Happy that I was strong, worked the hardest out there and felt good that I could easily win a race I rode with greater smarts. That's to come. This weekend I go for my final 3 upgrade points in Carnation and on Sunday its the TTT in Elma. YES!!!! News to follow! There is an underground dining experience in Seattle; call it a food rave. The primo of these is Gypsy where you MUST apply and be accepted as a foodie before you can be invited (I was invited based on my essay from a dining experience in France). The more frequent and less restrictive is Vagabond. Last night was a secret dining experience at Portalis hosted by Vagabond; theme Moroccan. Chelsey, Theo, Jae, Tom and me wined and dined. We shared a table with other foodies. I realized that foodies come in two forms; those who think they are foodies and rather pompous about it and those who are foodies and are purely into the gastronomic experiences of smell and taste and the communal sharing of that experience with friends. We had both at our table. Verdict? We'd do it again! Gypsy here we come! Another few pictures with warmth from the chair on route to the glacier hike a top Whistler...awwwww. Love Whistler. Came up here to play with my friend Chelsey and Jae. I basically would get about 2.5 hours of trail riding in on the buff and rocky trails...then met up with C + J for hiking, walking, people watching and whatever else. We cruised up to the glaciers today and walked around. It was absolutely gorgeous.